For me there is a mixture of emotions, there is a feeling of excitement and nervousness. Will there be some technical problems? I hope there are none, if some, I hope they are minor problems. I had rewritten the whole program in a different programming language. From a web based system being displayed in a web browser, it is now a desktop application. Step 1 The student will have to be verified first. He/she will have to present his/her ID card to the SEB (Student Electoral Board) member in charged of the verification, near the voting area entrance. The SEB member will write in a piece of paper the Student ID and the Pass Key of the student. (A Pass Key is a unique combination of random characters that will serve as a password.) This piece of paper will be given to the student. Step 2 Upon completing the verification process, the student will enter the voting area and will be assigned a computer terminal. 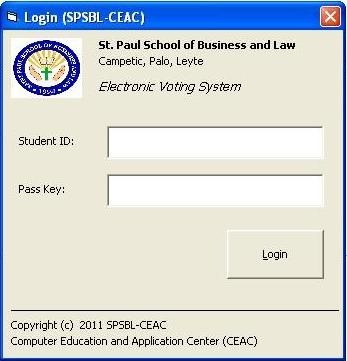 In the Log in Page, the student will have to type his/her Student ID and Pass Key. Step 3 The student will select a president and a vice president. 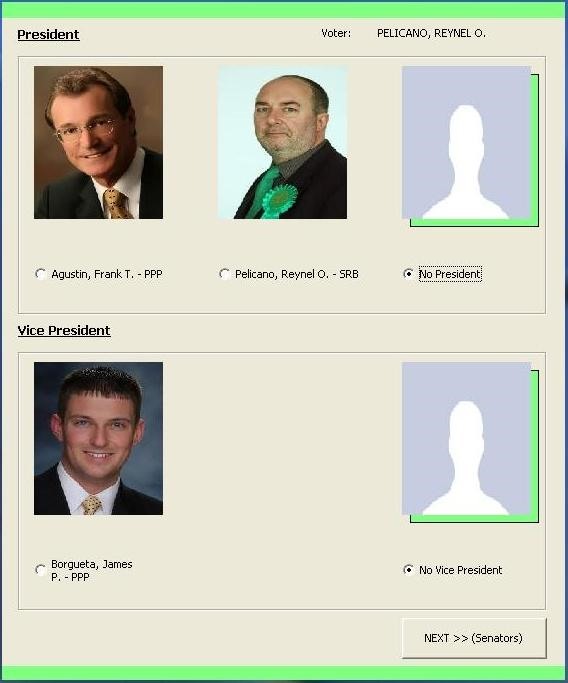 In the next page, the list of Presidential and Vice Presidential candidates will be displayed. The student will have to choose one candidate per position by clicking the candidate's name or the circle. Step 4 The student will select a maximum of 12 senators. 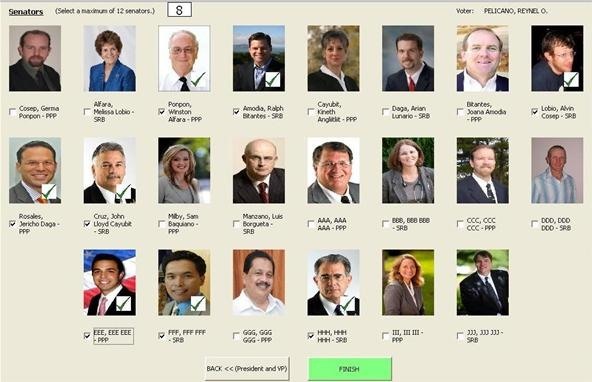 Clicking "Next" will display the list of Senatorial candidates. The student can choose a candidate by clicking the candidate's name or checkbox. The student can click the "Back" button to go back to the previous page (Pres. And VP page) or he/she can click the "Finish" button to finalize his/her votes. So that's it! The whole voting process will take a student only 5 minutes at most. Good luck to all the candidates. May the best men and women win. The election was a big success! There was a huge voter turnout compared to the previous years. There was some minor problems like disconnected cables and network problems due to power interruptions (LEYECO! grrrrrr...). But what matters is the quick generation of result and the accuracy of the vote counts. I would like to thank the SEB, my colleagues in CEAC, and the students who voted. Congratulations to all winners!